Myrna Erway is a busy lady. She squeezed our appointment between her duties of processing an action agenda and related documents from the previous night’s City Council meeting, attending meetings, creating an agenda packet for a Talega Joint Powers Authority meeting, and getting materials ready for the 17th sesson of the award-winning Leadership San Clemente program, which she founded. In her role as San Clemente’s City Clerk, Myrna’s responsibilities include caretaker of all San Clemente records and documents that need to be stored forever. She has recently completed a monumental mission to have all of these legal records digitized. A task that involved nearly three million total documents (including every action of the City Council dating back to San Clemente’s incorporation in 1928) and over 40,000 large scale plans and maps. These documents are now accessible to all City staff and some are even available for the public through the Community Development Department. Born in the small town of Ashland, Kansas, Erway’s first job was as a teacher in a little country school. Then, a five-year stint at Martin-Marrietta, helping build silos for nuclear missiles, took her and her husband to Arizona. But the hot weather drove them even further west to California. They landed in a young community near San Bernardino, called Grand Terrace. After a few years raising her two children, she took a job at Cal State San Bernardino. She met an instructor there, who also lived in Grand Terrace, and was working on a plan to incorporate the community into a city, a plan that would drastically change Myrna’s career path. She decided to help, and after the new city incorporated, she became their first City Clerk. Erway has also been awarded special recognition state-wide for her work on Leadership San Clemente. This program, consisting of eight weekly 3-hour sessions, aims to develop effective leadership for San Clemente’s future. The sessions include: General Government, Finance & Administrative Services, Community Development, Police Services, Beaches, Parks and Recreation, Economic Development & Pubic Works, Fire Services & Capistrano Unified School District. It works with the premise that the direction and success of a city is determined by the effectiveness of its leaders, and the more informed they are the more effective they’ll be. The program has now been implemented in other communities. Applicants from all segments of the City are encouraged to attend, though attendance is limited to 21 residents per session. 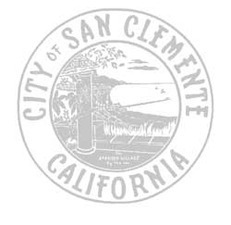 For more information, call 361-8200, visit the City Clerk’s office at City Hall, located at 100 Avenida Presidio, or the City’s website: www.ci.san-clemente.ca.us.